Hi. My name is Jo, I’m 24 and I have an obsession with leather pants. It started with a pair of Topshop leather shorts (which won over the new boyf may I add) and has now risen (or lowered in leg length) to trousers, albeit a cropped pair. 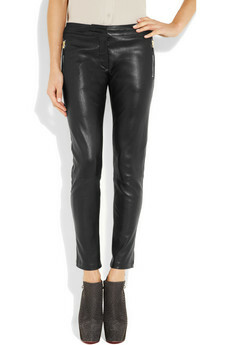 I feel every girl needs a pair of skinny leathers at some point in her life. Mine is now – minus the steaming hot sun. These are even Alexander McQueen for God’s sake.I won’t write the price out on here, it’s just too painful. Imagine them with an Alexander Wang slouchy tee and some chunky, stacked platformed boots. Hello rock chick…welcome to my wardrobe….